​November is National Diabetes Month in the United States and throughout the month, our social media channels will be focused on providing information about the management and diagnosis of both diabetes and prediabetes. So, what is diabetes? Put simply, it’s a disease that prohibits one’s body from converting the glucose from food into energy. It occurs in the pancreas but can impact nearly all of the vital organs. 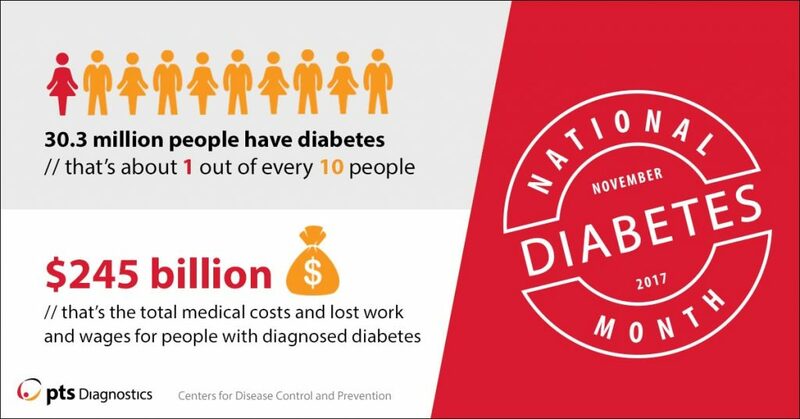 According to the Centers for Disease Control and Prevention, one in 10 Americans has diabetes. Perhaps even more startling, many at risk of becoming diabetics don’t even know it. A recent study published in JAMA finds that only 12 percent of those with prediabetes know that they have it and that half of all adults in the U.S. are either prediabetic or diabetic. An effective way of managing both diabetes and prediabetes is through point-of-care testing. With quick lipid, glucose and A1C measurements, physicians are able to quickly interpret results and use office-time to have a meaningful conversation about effective disease management methods. Moreover, point-of-care testing also increases the rate of diagnosis by eliminating the risk of patient’s failing to complete lab testing or not coming back to their physician’s office for follow-up appointments. A 2011 study by Kaiser found that the average turnaround time for lab results is 25-30 days; a delay in diagnosis that can have a negative impact on diabetics and prediabetics. At PTS Diagnostics, we understand that diabetes and prediabetes diagnosis can be overwhelming, so we’ve compiled online resources for disease management and support. The CDC offers an informative guide for Type 1 and Type 2 diabetics. The American Diabetes Association has a webpage dedicated to living with diabetes. Diabetes Forecast is the leading magazine for diabetics and maintains a blog with the latest news and diabetic-friendly recipes. The American Association of Diabetes Educators has compiled downloadable tip sheets and themed handouts to help patients navigate every stage of the disease. We encourage everyone to ask their primary care physician about their diabetes risk and the benefits of point-of-care testing. To learn more about our specialized point-of-care solutions and our commitment to helping diabetics, connect with PTS.